In any case, I posted it. And the damn thing got picked up on ‘Freshly Pressed.’ So. So, what? you say. Well, SO… even though I’ve been wanting to further unburden my oft-troubled soul of all the things I feel bad about from week to week — because it is, in some freakish way, cathartic for me — I’ve developed an irksome case of performance anxiety. Seriously, I don’t have that many more good stories about Catholic school. It was a generally positive experience, which makes me more than a little bitter when I consider how much material I really should have gotten out of those four years. I never even got my hands smacked with a ruler. Not once. Sister Marianne did staple my shirt shut on one occasion, but that is a digression for another day. As a rule, I’m not a fan of bloggy games. They seem like a lot of work to me. But we’re going to pretend this one is really fun. Mostly because I said so. My complete inability to cook even ONE healthy meal for the offsprings’ consumption while their creator was out-of-town on business. Yes, we ate out. Every. Single. Night. If you listen closely, you can hear their cholesterol rising from the depths of my bedroom. Allowing aforementioned offspring to be the last two remaining souls at summer camp for reasons I cannot even remember but am positive did not warrant the undue stress of feeling forgotten by the only parent within a 500 mile radius. Failure to complete the lone-requested Father’s Day gift — a mammoth, three-year picture project that was initiated exclusively out of a deep-seated desire for shiny new photo albums — DESPITE being awarded four full days of complete solitude last week and another four husband-free days this week. I am so screwed. Bad wife. Bad, BAD wife! Continuing to sort dirty clothes into elaborately-classified piles in the downstairs guest room, but not actually do a single load of laundry. Just to give myself the satisfaction of seeing empty hampers in all the other bedrooms. Neglecting to write checks, draft inspiring notes and mail cards for second cousins’ high school graduations in two different states, despite telling the spouse this task has already been crossed off his exceptionally comprehensive ‘To Do’ list. Unjustly administering the ‘I don’t care if you don’t want to eat it or don’t want to do it or you think it’s not fair. There are starving children in Africa and scared children in L.A. who go to bed listening to gunshots ring outside their windows, so be grateful for what you have and when I tell you to do something, just do it” lecture, out of nothing more than garden-variety frustration over screeching siblings who chose to ignore repeated requests to help pick up the avalanche of possessions sprinkled about my family room. In the meantime, feel free to unburden yourself in the Comments section. 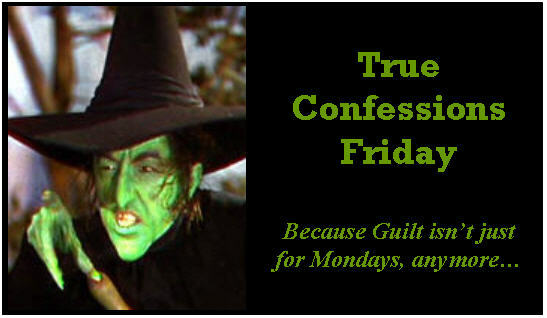 And if you know a good priest who can provide Friday afternoon absolution, send me his contact information. I seriously doubt my Craig’s List ad is going to attract the right candidate for this activity. We are kindred spirits. You make me feel normal and I love you for that! Happy Friday. 1. Even though I think crap food is killing people, I have eaten fast food approx. 5 times this week. That doesn’t count the times I’ve been out to eat at “sit-down” places. 2. I’m eating all this while pregnant, which I felt determined I wouldn’t do this time around. 3. B got selected to attend a pre-Kindergarten summer program for kids who didn’t do well by the school system’s standards on their assessment for Kindergarten. He’s not going (though I’m sure he’d love it). Partly because it doesn’t work with our schedule, and partly because I feel like he has his whole life to be in school. Why start the pressure when they’re FIVE? Plus, he’s already a genius…he just hasn’t been very interested in literacy…or drawing a person when asked…or stating his address (which I’ve never taught him, ahem). Oh girl, it’s so hard when you are pregnant and raising a child (and then parenting TWO) to completely avoid the convenience of fast food. When I was pregnant with Griffin, I was sure that kid was going to come out with a head in the shape of a philly cheesesteak from Steak Escape! And don’t worry about B — he’s a smart cookie. He’ll do fine in kindergarten. You’re instincts, I think, are right on about school. They don’t need to feel like they have a ‘job’ any sooner than necessary! I’m a repeat offender this week. My 4 year old has gotten into ZuZu Pets and I have threatened (a minimum of 7 times since Sunday) to throw the ZuZu Pets in the garbage if she didn’t do XYZ. One time I even grabbed them and headed toward the garbage, dangling them over it while she cried, “No, mommy, I’ll do it, I promise.” Uh oh, I think Mommy needs a time-out. Oh yes. Laundry is my nemesis. There is definitely weekly guilt surrounding either dirty clothes or piles of clean ones waiting to be put away. I absolutely LOATHE the putting away part. And if I could tell you how many times I have threatened to throw something away or eat someone’s face to elicit unquestioning obedience, you’d shorten your time in the penalty box. Or at least construct a ‘time out’ that involved some QT in the pedi chair. For claiming the the creative outlet my blog affords me was far more relevant and necessary to the running of the household than cleaning the bathroom, I am probably in need of some sort of penance. Or absolution. Or last-rites. Darnit…see how much trouble I get in for being raised agnostic? I don’t understand any of the terms. I get lost asking for bathroom. And don’t get me started on my Jewish husband and family. I can’t even pronounce the NAMES of their holidays. I am fearful you have acquired a genetic predisposition for guilt.Of all the things I passed on to you I WAS Hoping guilt was not one of them. See one more thing to feel guilty about. a lot has changed these days in the business practices of religion and such. you know, I am not even sure if the acts you have confessed here are even considered anything less than absolutely fine, smoking hot perfect parenting. Haha…I’m reading this on Sunday, so I don’t have to confess, right? Oh, thank you. You make us all feel better. Yesterday at lunch time Sally kept moaning that she was hungry and all I could think was “really? I have to feed you EVERY day? You’re 3 — do it yourself.” Ugh. I know, right? After the first year, you’d think they could be a little more self-sufficient! I’m having a bloggervention with you. Where have you gone?